Daphne will Collaborate with the Winner of the 237Showbiz Music Competition! A look into the artists Career. The finals of the 237Showbiz Music Competition kick starts tomorrow the 6th of November and we are all excited to have 10 finalists out of 120 contestants who registered for the Season II qualifiers of the competition. This year, we planned on making it bigger than that of last year. Instead of a cash prize of 50.000CFA and full promotion of the winner’s first official single, we decided to make things bigger and better. 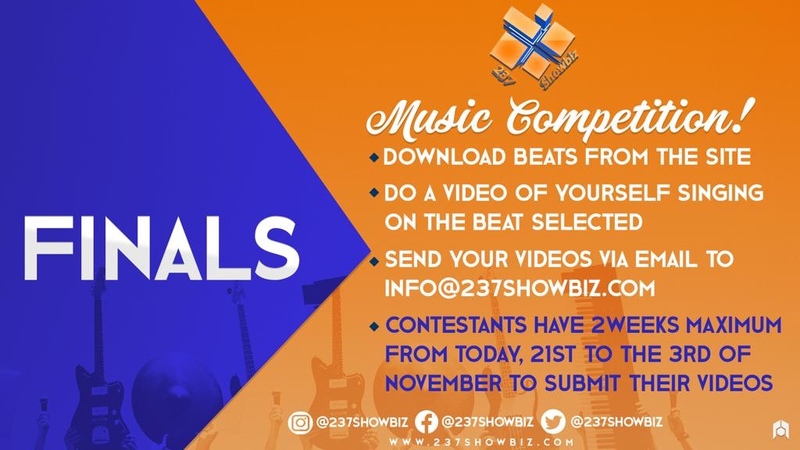 The Season II of the 237Showbiz Music Competition will see just one winner, a new born star walk away with a cash prize of 300.000CFA, a collaboration with an A List Cameroonian Artiste, A video shot and directed by an A List Cameroonian Video Director and a full promotion package of one month for the song. Daphne known by her real names Efundem Njie is a singer/songwriter currently signed with Stevens Music Entertainment LLC known by many as simply “Steven’s” or “SME”, a Charlotte, NC, US based recording company owned by an amazing Cameroonian clique of music lovers. Daphne’s introduction to the Cameroon and African Music scene first Came in 2014 with the release of her hit single “Rastafari” that spread all over like hausa perfume. She has since then flurorished and blossomed to not only a Cameroonian star but an African sensation releasing multiple hit records in the likes of Calee, Ndolo, Jusqu’a la gare, Promets Moi, with a very promising future in the African Music industry and the world at large. With proof of excellence from her previous singles and with her huge social media following, it is safe to say the 30 year old super star has carved a niche for herself and made many to believe. Daphne in just 4 years has worked her way up from an ordinary university girl who just wanted to sing for the fun of it, to a name you will mention when you are talking about top urban music acts in the Cameroon music industry. Born in Buea in the year 1988 on September 20th, the heart of Cameroonian entertainment as it is fondly called, the singer grew up in the economic capital city Douala. As a singer and one who passes messages using her voice and the right tune, touching the lives of people who stopped believing in their dreams, in their lives and who only think about giving up is one of her goals. For someone who loved singing since she was a kid, she would use music to overcome her difficult moments. The singer only began paying visits to studios in her early days in the university. With her first recordings done in the year 2013. The singer claims her inspiration has always God and her mother. She also gets her inspirations from her culture, experiences that gave birth to a style of music that contains Makossa, Afro-pop, Reggae, Afrobeat and Pop. Her Music has seen her win various awards including Afrimma Best Female(Central Africa) and she has received nominations to several prestigious awards including Best new act at the Kora Awards. Daphne has had shows in the US, Europe and all across Africa with usually a massive turn over in most of her concerts and shows. She describes herself as simple and playful while holding dear the moral values of her upbringing . ” I believe in God”, i believe in working hard for what i really want, i believe in the people around me and i believe in myself. Here To Stay (Debut Album) -Released 30.12.201S. “Here To Stay” ls a beautiful collection of 19 tracks. A blend of songs that has their roots in Afrobeat, Makossa, Bikutsi, Pop, Salsa, Hip Hop and R&B all woven together seamlessly by Daphne’s Sultry voice. “Broken” and a Makossa-Zouk infused beat on ‘Ndolo’. Calee – Released 02 02.2017. Ndolo (Remix ft. Ben Decca) -Released 29.06.2016. With such a hefty profile it was just right that we invite just the Very Best to do a Collabo with the soon to be known winner of the 237Showbiz Music Competition. Who will be the Lucky one? The 10 Videos from Okunol, Black Fame, KOWAN, Nivo -TI, Ac Prince, Recky Dasha, Epiesco, Don Franco, Pouncy Kido and Treccer Fresh will be published on the facebook page of 237Showbiz on Tuesday as from 7pm. Wait for it!!!! I must confess that the choice is just what I had ever wished for. I’m more than ever determined to be the winner. Will the final be streamed online for people across the globe to be part of? I think some people will be behind the scenes to promote a talent as well.